Here in the Pacific Northwest, it seems like the winter weather has gone from 0-100 in the matter of a couple days. One day it is raining then the next it is cold, snowing and icy. This kind of weather not only wreaks havoc for drivers and students, but also for those with limited mobility. Several weeks ago we started a new blog series discussing the perils of winter weather for our elderly loved ones. We started off exploring the dangers and warning signs of hypothermia. (You can find it here) This week we continue our trek through the perils of winter by covering winter slips, trips and falls. The statistics regarding falls among the elderly in general are alarming. It is estimated that falling seriously injures up to 300,000 people over the age of 65 each week. That number increases greatly when conditions are cold and slippery. 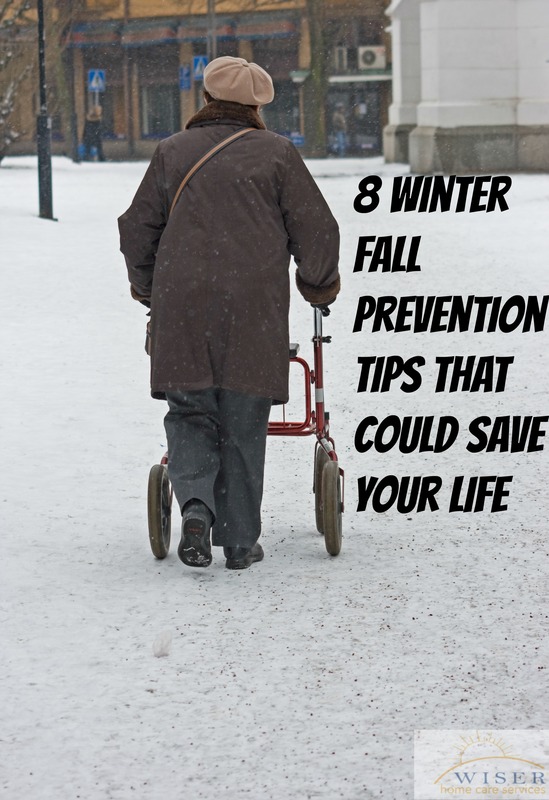 Even scarier is that falls are the leading cause of death for those over the age of 75. As alarming as these fall rates are, it may come as no surprise that elderly falls prevention is a hot topic. These simple tips may seem like no big deal, but if they prevent even one fall it could ultimately save a life. It is important to note that if your loved one suffers from arthritis, diabetes, complications from a stroke or poor circulation, it would be best to keep them out of cold weather. These diseases often cause sufferers to have diminished feeling in their feet which impairs balance. If your loved one is taking medicine, make sure that they don’t suffer a side effect of dizziness or light-headedness, as these will cause balance issues. Before walking outside, make sure your loved one is comfortable walking inside. Keeping them active and their muscles limber will help reduce the chances of them falling. Choose the right shoes – Make sure your loved ones shoes fit correctly and have the appropriate amount of grip to prevent slips. Don’t Trust the Surface – Black ice can form fast and can be undetectable to even young eyes. Take every step with caution. Baby steps will help. Use handrails if at all possible. Use the buddy system. If possible, never let your elderly loved one venture outside on their own. Walking in groups is safer. If they must go alone, make sure they have a cell phone in case that fall. Plan ahead- Planning ahead will allow your loved one to minimize their trips outside which will minimize their risk of experiencing a fall. If you are worried about a loved one this winter or would like help ensuring their safety, don’t hesitate to contact us. Wiser Home Care Services can help establish a care plan to personally accommodate your loved one’s needs and help prevent falls.